Check valves are ubiquitous throughout fluid processing operations. These simple devices permit fluid flow in one direction only. 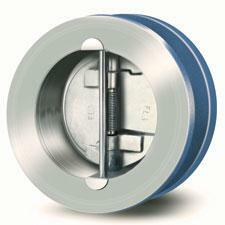 While there are numerous design variants available in the marketplace, operation is very similar in all check valves. Fluid pressure and movement in the desired direction moves a plate, plug, ball, or other obstruction to a position that allows flow to pass. The plate or other obstruction has a design countervailing force applied to it by a spring, gravity, or some other means that will move the trim to the closed position. When pressure drop across the valve decreases below the design level, the trim will close. Fluid pressure exerted on the outlet side of the valve will maintain a closed position in the valve. In this manner, a check valve allows fluid to pass in one direction, but not in the reverse. Share your fluid process control challenges with a product application specialist. Combine your process knowledge with their product application expertise for effective solutions.